My grandmother had exquisite taste and so I don’t get the term, “Granny Decor.” It sounds pejorative. Can you explain these terms a little better? Those are all great questions and ideas. I realize that there’s some confusion here. Granny Decor is a style of home furnishings that is not classic. It is generally lacking in style, proportion, cohesion and reeks of all that is cute and precious. Granny Chic is an ENTIRELY different animal. But, quite frankly, Granny Chic is simply a new marketing term for country cottage. Or, maybe country cottage with some bohemian thrown in. And, perhaps with a strong mid-century bent and bright, fun, happy colors. It is often full of whimsy. 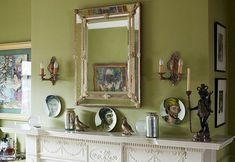 A great example of Granny Chic decor is the beautiful, charming work of the design firm, Madcap Cottage. Madcap Cottage is the interior design firm of John Loecke and Jason Oliver Nixon. BTW, You can find well over 300 cool and fun Madcap Cottage products at One King’s Lane. AND the promo code OKL20CARD will give you 20% off on them! They have some wonderful wallpapers and many of their items are vintage! Also, when they say that a pillow is vintage, they really mean that it is a custom pillow. Their pillows are not used! So, then, What IS Granny Decor? And is it a pejorative term? 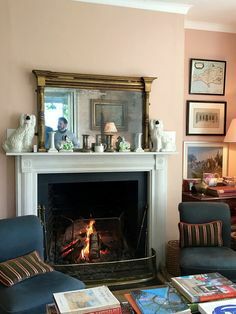 It’s a style of decor that is lacking in classical, timeless style and that either reeks of saccharin sweetness, or is phenomenally tacky, tasteless, banal, disproportionate, unbalanced and looks exceedingly tired and well— old. Granny decor is NOT a function of the age of the person. However, some aspects of Granny Decor are vestiges from an earlier generation. However, I have seen dozens of homes of YOUNG FOLKS who decorated, not in Granny Chic, but in Granny Bleak, we’ll call it. Another aspect of Granny Decor is decor which is fake (aka: ERSATZ, Laurel’s favorite word) and thoroughly CHEAP LOOKING. I am well aware that the readers of this blog fall into all economic classes. So, I want to make it clear that I am not in any way trying to shame those who have little money to spend on home furnishings. I’ve been there too and understand the struggle, more than you’ll know. However, in some recent blog posts, we have looked at some talented readers who created a beautiful family home without spending a lot of money. In fact, sometimes Granny Decor is about home furnishings that are not only unnecessary, they are bringing down the entire space. So, that is what this is all about. ***And, this is super important. *** This is only STUFF. And, stuff is not nearly as important as people. Not even close. I am saying this because I know that some of you are going to have some of this stuff in your home. You might even like it. Or maybe you’ve stop seeing it. So, let’s get into the specifics of Granny Decor. And, please, do not pin any of these frightening images. Of course, you may pin the beautiful ones and the ones that I’ve made as a graphic. art work that’s too small, ditsy, cheap, or cutesy. Well, actually, anything that’s too small, ditsy, cheap or cutesy. Really? Just do some finger paintings. Anything would be better than this. Plus, could they have made that wall any uglier? NEVER HANG ART IN THIS FASHION. DO YOU HEAR ME??? IT EITHER GOES SIDE BY SIDE OR ONE ON TOP OF THE OTHER. ALWAYS! Sorry to shout, but I don’t know what it takes to get this to stop! Maybe if we all start shouting together. on the count of three. This is a beautifully executed art wall. For more gorgeous art walls, templates and ideas click here. lace doilies – at least, in the living room. Not to mention that the photo in the contemporary steel frame and the placement of the table is all kind of random and not working at all. But, Laurel… How are you supposed to protect the table? Thank you. That’s a very well thought-out and lucid question. The answer is that if you have something abrasive going on the table, THAT is what needs some felt under it. Nothing says Grandma or Granny more than things like glass on the table or plastic slipcovers. and more ruffles and saccharin pastels. icky-poo. Ugh. Not only is it neon white, polyester lace. It’s neon white, polyester lace against stained wood with the wood showing. Absolutely grotesque. This is like a woman who forgot to shave her legs, AND her slip is showing. Ruffles and a shell theme. No. And valances alone, usually say Granny unless very tailored. Of course, never any heavy swags; only if you’re really super formal. Most people aren’t these days. Not even the royals! Above, Miles Redd uses florals and a bit of ruffle judiciously. Although, I’m still on the fence about this ruffle too. But I don’t think it says Grandma. It’s just a little too feminine for me. But, at least, it’s classy and sophisticated. Eegads! It’s like the worst bridesmaid dress you’ve ever seen! All that’s missing are Granny’s eye glasses and her copy of Reader’s Digest. At least there’s a hardwood floor. no flood-length drapes— please! And, of course, the rod should be hung higher. One tip I’d like to suggest is that if you moved into a home and I don’t care if it’s 20 years ago and you are STILL living with the same horrid window treatments the previous owner put in— And they don’t do anything except scare burglars away, please take them down. I promise. It’ll change your life in positive ways. They’re actually trying to sell this place. What’s with the dried fake leaves over the doorway? So weird. Even Gran thinks so. Actually, this is more like crash-pad decor. But, we’ll let it go for now. But, remember the floral slipcover in Ben Pentreath’s kitchen? It’s a proper English tea-drinking-Granny-floral-slipcover but the acidic yellow wall color is what makes it work. And Laurel’s orange Michael Kors handbag. haha. I still use it and love it! It’s holding up very well! shiny polyester – anything. Please try not to have any of that. wimping out on the wall color. There are lots of wimpy wall colors in the don’t photos.And for 21 interior design mistakes to avoid and including more wimpy wall colors, click here. If you need to do wall-to-wall carpeting, IMO, it should preferably be tailored and woven, like this Berber carpeting, above. cheap t’chakas. You know what I’m talking about. This is from the set of the show, Roseanne. It sure ticks a lot of boxes. It’s Granny Decor on acid! And, here we go again! The window casing should NEVER show when hanging drapes. Granny needs to hire a professional window treatment installer! For more info about how to hang drapes and everything else you’d like to know click here. And for difficult windows, please check this out. all tables, chests, cabinets, etc. are dark brown. It all gets very heavy and difficult to live with unless the walls are also a hunky color. But they usually aren’t in Granny Decor. I love painting the inside of china cabinets. This is another beauty from Madcap Cottage. Also, please check out the china cabinet I designed and had made for a client a few years ago. dated lamps and other lighting fixtures, as well, with ersatz finishes mimicking what, I don’t know. it goes on and on… That is a very bizarre finish on that lamp. It looks like Lawrence of Arabia after six months of riding a horse through the parched desert. Why would anyone want that in their home? Actually, I found most of these things on one entire website devoted to Granny tacky. Their tagline is A HOME LIKE NO OTHER. I can assure you that they are never going to be in Laurel’s Rolodex! But, there are dozens of fabulous vendors on Etsy and Chairish in the newest edition of Laurel’s Rolodex which came out in November. Note to current rolodex owners, if you can’t find yours, it was sent to you at the email address you purchased it with. Please first do a search of your email before contacting me. You can put in SENDOWL. I very much appreciate that. Any link, even if it’s three years old will give you the updated rolodex for you to download. The change is on my end. For some good ideas for cheap lamps that don’t look it, click here. There’s still more Granny Decor Faux pas to go! Oh, so bad… Looks like Granny is sharing digs with her grandson. Actually, this isn’t the worst wallpaper. It’s just not right for here. And that window! Above is a beautiful use of a floral in a bathroom shower curtain. I love the juxtaposition of the flowers against all of the white. It looks fresh and stylish. And loving all of the brass too! They should never have existed in the first place. There is nothing more hideous. Well, almost nothing. They’re not explicitly Granny, however. just a little reminder to pin to Pinterest. Well, I hope that you enjoyed that. I think that the main take-away regarding Granny Decor is that they make it because people buy it. If people stop buying it, they won’t make it. Right? There are alternatives. Please check out this week’s hot sales. There are so many fabulous sales going on and beautiful new pieces to see in the widgets. And, some of the sales are ending very soon! An acquaintance of mine was so very proud of her newly-decorated bathroom and showed me photographs of a flower-bombed fabric toilet tank and lid covers, complete with deep lace-covered ruffles and matching ruffled window curtains, shower curtains and coordinating wallpaper. hilarious as usual!!! And my grandma’s name was Elsie as well! And HER neighbor (in the Bronx) had an entire living room of furniture upholstered in clear plastic over the fabric. Not laminated fabric, it was upholstered on top. Weirdest and most uncomfortable thing EVER. Hello Laurel, Perhaps we need to make a further distinction between granny decor and just plain schlock. To think that there is at least one entire site devoted to selling this stuff! It’s too bad the we no longer have Paul Fussell to provide appropriate commentary. I think my grandmother was the first person I knew to point out ersatz furniture. That furniture from the “Roseanne” set used to be passed off as “country” style furniture in the 1970s/1980s. I chuckled through the whole post but I almost spit coffee all over my desk when I got to this one. I plead guilty. I have had lace curtains and vertical blinds. But that was before I knew any better. You forgot floral sofas. Mine is in the living room. I’m too cheap to get rid of it or have it reupholstered so it stays. But I don’t hate it. I had a lamp in that same room that had been my Mom’s. It was a ceramic lamp of a peasant girl. The colors went with everything in the room. But, that, with the sofa, “dated” the room. But, it was my Mom’s lamp. I did replace the lamp with a more up to date one, but I felt bad. Just when I thought I couldn’t love you more, you wrote such a wonderful start up to this story! You do such an amazing job of being inclusive AND relatable! I read this late, late last night and crept into my living room to look for Granny touches. Found just a few to fix. Someone dear to me makes doilies, but I’ve been dodging their offers. I just… cannot. Regarding faux greenery/flowers: when are they Granny and when are they good? I’m a recent convert to your blog (and paint guides, thanks very much for those!). I so look forward to Sunday morning when your blog arrives. What I particularly like is that you take the time to put so many links in to your previous ones – I always end up with about 12 tabs open to peruse during the week, and I learn so much (this week: why two of my lamps look so dorky; window treatments; roman shades; 21 decorating mistakes, etc., etc.,etc.). So funny that you posted this because just a couple of days ago Sarah Bartholomew posted a room on IG that had some chairs that screamed granny to me. Plus she covered the chandelier shades in the same fabric. It was a beautiful room otherwise but it caught me off guard, because I thought it looks so out of date! Well, of course, I had to look it up. I found the fabric and this stuff is hand-screened and insanely expensive from Bennison. I am following you blog and taking notes of everything but I wouldn’t like to get rid of these pieces and don’t have much money left for new furniture… And have you found a way of using doilies successfully? You know. My dear friend Elaine who died four years ago was the “granny type,” doilies and all. I loved visiting her home though, because it was a reflection of her. I do hope you and the rest of the readers Know that Many-Many-MANY Folks in the MID WEST’s HOUSES look JUST like those examples….!!! I know!!! I’m from the midwest. Born in Chicago. Raised in Evansville, IN. Visited relatives in St. Louis. And also lived in Madison and Milwaukee, WI and visited the latter, dozens of times after I moved away. I’ve seen it all! Hello Laurel, really great post! Loved your hilarious commentary! My mother in law has what I would call very English mixed with Granny decor. She is English, so florals, a bit of clutter, many antiques…and border wallpaper on the chair rail, with a small scale floral beneath it on the lower wall! But then she mixes it with white upper walls, and bright upholstery fabric…I’m actually so fond of her thoughtfully decorated house, even though she does have flood length drapes, and even though there are lots of design mistakes! I guess there must be a continuum of Granny decor, she’d be right in the middle…Granny-Trad. I think I know what catalog company many of the Granny pictures are from because for several years I received their catalogs. Why, I don’t know. I would look through it and wonder why people would spend their hard-earned money on decor that was so awful. It actually made me feel a little sad because I know that for the same amount of money they could have purchased something better. 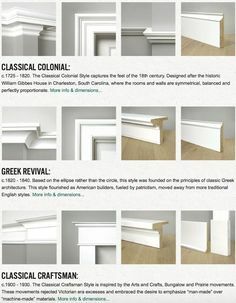 Before the internet it was more difficult to be educated on good design, but now we can all access examples of attractive, classic rooms through blogs such as yours. I linked to the online company in the post, but it could be a different catalog company. I’m sure that there’s more than one. As for HGTV. I beat you to it a long time ago. In fact, it was this post that helped my blog turn a very big corner back in 2014. All of your examples made me chuckle. And they make me wonder, what things are we doing currently that will be referred to as Granny Chic in 50 years? A word on European lace curtains: here in France there are some lovely examples of flat panels in coarse lace. Equally there are some truly revolting ones with “kitchen” designs involving jars and coffee pots, or cherubs wielding mini watering cans, with a bit of colour added here and there for “interest”. Goes to show that almost anything can be beautiful or loathsome, depending on how it’s done! It is amazing how many grannies don’t fall into the “granny cliché.” And yet, younger women do. They don’t perceive it as looking bad. But, I imagine it’s because they haven’t been exposed to much of anything else. Geeezzz… It is nearly 25 years ago and I helped my step-dad design a building he was having built for his business. I’m thrilled that I didn’t do TOO badly, but my lace (Scottish-loomed, 19th-century repro, mostly cotton) curtains fall only to the window sills. I wish they were longer but I don’t know what else to do: there’s a large, wide steam radiator (with a deep wooden cover) under one window in every room, so floor-length curtains are out. And lace gives us privacy and light at the same time. I’ve been advised to switch to sheers, but they are either icky polyester or flimsy cotton net that’s too see-through. I’ve seen photos of your home and it is quite charming. And, the decor is appropriate for the age of the home. 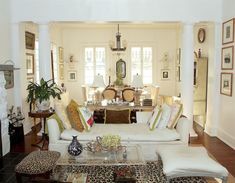 Definately not a fan of this Miles Redd room although I typically do like his style, just feels a bit dated. Vinyl nail caps for cats were invented by an American veterinarian more than 20 years ago. Cats’ nails shed about every six weeks, so you do have to reapply as they fall off. Young kittens shouldn’t have nail caps, but I believe you can start putting them on at around 6 months. Soft Paws has a variety of sizes and colors, and all cats can wear them. It’s a far more humane answer to the curtain climbing, furniture scratching, fighting with the other members of their cat family and clawing visiting toddlers who have picked them up by the tail. It’s a pretty quick process to put them on, doesn’t hurt the animal at all, allows them to still stretch and strengthen their front legs on a proper surface–a scratching post! It also takes some of the frustration out of living with beloved pets. Oh, they have them for dogs, too, especially for heavy dogs who might damage wood floors. I use a different color for each of our three fur babies. When I see the color of the nail cap, I know which kitty needs a new Soft Paw. None of my cats seems to mind at all having them put on or wearing them. Check out SoftPaws.com! Loved this post. I can’t tell you how many times I’ve walked into homes for sale…and I’ve seen many of these granny decor items. When I ask them to remove the wallpaper borders or change their bedding to something white and crisp – their either dig their heels in or look at me like I have 3 heads. Don’t get me started on vertical blinds – they seem to be ubiquitous! I once did a presentation in a realtor’s office and I was going over the top 20 things that date your listing…vertical blinds was one of them. A few realtors couldn’t believe that these things were outdated treatments. Oh brother! Thanks for a great post, and a good laugh! Ironically, my two grandmothers actually had some lovely pieces, but my mother…not so much. Your wonderful post had me thinking back to some of the most cringe-worthy decor in my childhood home: I think the prize goes to a mirrored wall opposite a gold-and-white Greek-inspired scenic mural in the (narrow) hallway of our suburban Long Island home….bleeech. Thanks for the funny post!! I’m glad I read it all the way through, because I was considering putting a thin piece of glass (!) on top of an Oly Studio coffee table top, but now I will not purchase it at all!! Ive heard that Oly Studio tops scratch easily; Is that true in your experience? I enjoyed this article about what not to do (and gagged, too! ), but now could you do a piece on good use of antiques? I have three storage rooms filled with true family antiques, some dating back to the Civil War. Many of them are exquisite but I don’t want an entire house filled with them. Whatttt! My drapery hanger put the tissue in the balloon valance to make them POUF in the 80’s! All the draperies cost a small fortune. I think that’s one of the reasons that we see so many non-decorated windows. The cost of fabric and custom made wreck the budget. And then the decorating trend is out in 7-10 years. So we start all over again. 2. When I try to figure out what to replace them with, I get so tangled up in the complex logistics of what to replace them WITH that they just…stay up. Another entertaining and oh-so-spot-on post! I used to adore anything old, and have inherited a few pieces from both sides of the family–nothing valuable, but definitely important to me. One such piece is a little sewing cabinet that used to sit in my grandmother’s guest room where I would sleep when I visited. She has been sitting in my powder room for 19 years due to her simple lines and storage. But last year when I redid my powder room to bring it into the 21st century, I decided that my sweet little cabinet needed a makeover. I cleaned her up and painted the body and legs with with glossy black paint, leaving the drawer fronts a medium dark wood color, like you see on some mid-mod dressers. Then I cleaned the grime off the original knobs, and now they sparkle like jewelry. She’s over a hundred years old, but is thoroughly modern now. I’m glad I talked myself into it! Take care, and I hope you aren’t encased in ice like we are here in Illinois. That was too clever and cute! I didn’t know I what I did was wrong, I swear. The picture thing, hanging them offset. I do that. I WILL FIX IT. I love to read your blog so very much, I am always either charmed or informed or laughing, but generally all three. XO BIG TIME. It did take introspection(me) and education ( from you). I realized the two major style influences in my life, whose looks I was ALWAYS trying to replicate was my both of my super stylish grandmothers. One was a very chic, hilariously funny, well mannered and glorious single parent in the 50’s. You know she had a will of IRON to survive. And her home was beautiful, full of antiques which I realized as I got older were likely very cheap and somewhat dated when she got them but yes, she got all wonderful quality and recovered things, I recall going to a lamp shop for a third time as she looked for just the right shade, my mother would NEVER have done this, moms taste is awful and runs deep to Tacky Beachy. The idea as a teenager of going to a lamp store for the perfect shade instead of buying whatever was a very new and fancy and interesting idea to me. Her home was beautiful and very formal. My other grandmother was a designer and artist, her home was a bit more casual but beautiful danish mid-century will lovely art and colors and textures. Well, Laurel, this makes us all feel better: tons of mistakes we’re not likely to make! I clicked on your link to the source of many pics, and while their name offered further hilarity, it was a relief to note that they say “you won’t find this anywhere else”.